Gadget Guard Enterprise Solutions protect your mobile device screens and your productivity. Mobile devices work hard day in and day out. Their screens take a lot of abuse from drops, stylus’, dirt/debris, and constant use. Gadget Guard provides the ultimate level of screen protection against the daily use and abuse devices endure in a commercial setting. Our broad product selection protects your device and the productivity of your staff. Reach out to Gadget Guard Enterprise and ask about protection solutions for whatever device is used by your team. Gadget Guard’s breadth of product offering serves commercial and B2B channels better than any other screen protection manufacturer. The Gadget Guard line of products adds an extra layer of protection to your device without sacrificing the fit, form or function. Today’s work is mobile. A broken screen means you are without your device and less productive. Make sure you protect your mobile devices with Gadget Guard’s Black Ice Edition tempered glass screen protection. The Black Ice Edition is designed to take the impact of everyday calamities and protect the screen of your device, keeping you on the job. Your business should be your business and no one else’s. Protect the information on your device from visual hacking with a Shadow On-The-Go Edition removable and reusable privacy screen. The Shadow On-The-Go Edition allows you to place a privacy screen over your device when you are in a public area or a location where you don’t want others to see your information. Now you can use your laptop on a plane without the person in the seat beside you seeing everything you are doing. When you don’t need privacy, peel the protector off your device and place it on the included storage card for use the next time you need it. The Shadow On-The-Go Edition can be used on top of a tempered glass screen protector. You are a professional so you want your business’ devices to look professional. The Gadget Guard Original Edition is completely clear, will not peel or discolor and can be removed without leaving a trace. The self-healing, patented film has optical grade clarity, developed for use by the U.S. Military. The Original Edition protects the screen of your device from the scratches of everyday use. This level of protection and quality cannot be matched by cheap imitators. Your day is already difficult. Don’t let screen glare from your device make things more frustrating. The Gadget Guard Black Ice Anti-Reflective Edition tempered glass screen protector reduces screen glare by up to 80% making it easier to find and access your important information. Whether you are a public safety officer or a professional on a tight schedule, seconds count. Gadget Guard’s Anti-reflective screen protectors have the same exceptional quality as the popular Black Ice Edition to make sure your device stays safe while making your life a little less frustrating. Mobile devices are part of serious education and should have serious protection. The Gadget Guard Black Ice Edition tempered glass is designed to take the impact of today’s students, instead of leaving it to fate and your devices unprotected screen. The .33 mm tempered glass Black Ice Edition is designed to protect the device screen from student life. A broken screen can mean costly repairs and trying to work with a loaner device. Mitigate the risk with a premium, high quality tempered glass screen protector from Gadget Guard. Eyes have a tendency to wander in a classroom. The Shadow On-The-Go Edition is a removable and reusable privacy screen that helps keep your students honest. These removable privacy screens can be passed out before testing and collected after using the included storage card. This also makes it easy to share the Shadow On-The-Go Edition with multiple classrooms. There is no longer a need to use clumsy cardboard carrels and isolate your students. Using Shadow On-The-Go Edition allows you to keep an open class room and see which students may need a little additional help while knowing the person next to them is not seeing the answers on their desk mate’s device. Students can be hard on mobile devices. Sliding them in and out of book bags or bumping them on charging carts can be hard on a device screen. Protect your investment with the Gadget Guard’s Original Edition screen protector. The Original Edition is an optical grade, self-healing, patented film which keeps your device screens looking new without discoloration or peeling. The wet application ensures you have a glass like feel with no bubbles for a perfect installation yet can be removed without a trace protecting the value of your device. Originally designed for U.S Military applications, the gadget Guard Original Edition provides protection for what today’s students dish out. Personal medical information should stay private. Gadget Guard’s Shadow On-The-Go Edition offers removable and reusable privacy screen protection that makes sure the medical information on your devices is not being seen by the wrong person. Don’t risk information being visually hacked in a waiting room or other area of a hospital or office. Shadow On-The-Go Edition privacy screens are easily removed and replaced on a device thousands of times over. If the adhesive begins to lose its stickiness, it is easily cleaned with tape for endless uses. The handy storage card allows you to store your privacy screen when not needed in a safe location to prevent damage. Are you getting all the germs out of the scratches on your device screen? Here’s an idea - prevent the scratches! Install a Gadget Guard Original Edition screen protector to keep your mobile devices looking new and clean. The Original Edition is our patented, optical grade film originally developed for U.S. Military applications. Its self-healing properties keep your device screen looking like new while providing a glass like feel that does not peel or discolor. The Original Edition can be installed wet to give a bubble free application and is easily wiped down with cleaners and disinfectants to keep your devices safe. Mobile devices can be a critical link in today’s Federal, State or Local government operations. This means you need to protect those devices. You can’t afford to be caught with a broken screen in a mission critical situation when you need your mobile device. Gadget Guards Black Ice Edition tempered glass screen protectors can mitigate that risk. You want to scratch or break your screen protector, not your device. Gadget Guards lifetime warranty allows you to do just that with the comfort of knowing you are protected. The Black Ice Edition protects your mobile device from everyday calamity’s with is a .33 mm tempered glass screen protector that keeps you on the job and focused on the mission. Each Black Ice Edition screen protector is specially coated to prevent fingerprints and smudges giving you a better user experience and is custom fit to your device. You have sensitive information on your device. Do you know who is standing beside you trying to catch a glimpse? The Gadget Guard Shadow On-The-Go Edition removable and reusable privacy screen is your first layer of security defense making sure your information is only seen by those who are supposed to see it. The two-way privacy screen prevents everyone from seeing what is on your device. The screen can be easily removed and placed on the included plastic storage card when not in use. The adhesive is easily cleaned for thousands upon thousands of uses so you always have privacy when you need it. The Shadow On-The-Go Edition can be used on top of the Black Ice Edition tempered glass to give you maximum protection against breakage and privacy. Mobile devices that are used a lot are naturally more prone to scratches. Whether it is from sliding in and out of your holster, sliding across your desk or even a parking lot, the Gadget Guard Original Edition is the most economical way to protect your devices from every day scratches and calamities. The Original Edition was developed for U.S Military applications and is tested to MIL STD 810G for scratch resistance. The optical grade, self-healing film ensures your device screen is protected and always looking its best so your screen can be easily read and preserve the value of your device. Do you have a large mobile deployment with lots of devices? 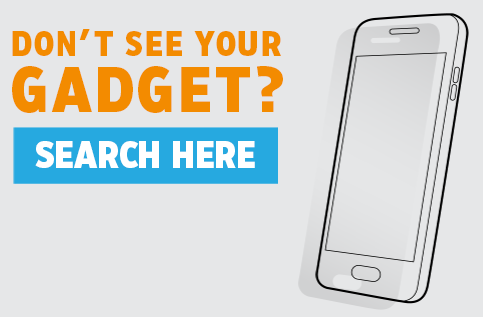 Are you interested in protecting a device not found in our product list? Complete the form below to have one of our product specialist reach out to help you find a solution to meet your needs.